The Western mobile app now features a refreshed design. The all-new dashboard has all of your favorite links, but now fits on a single scrolling page, and also includes links to all of Western’s social media channels. 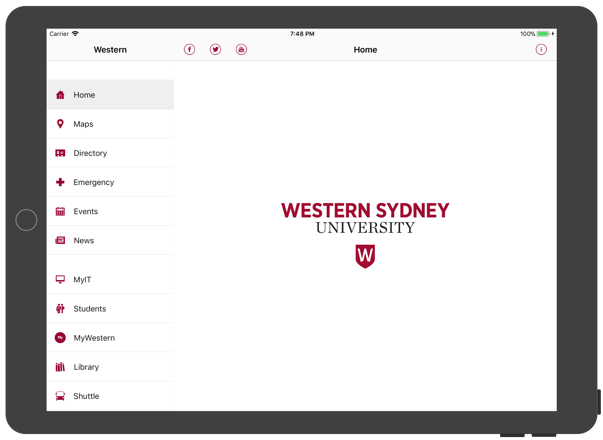 Access all the links and features of the Western app, now on iPad. Maps - Find Western Sydney University buildings and see your location on campus. Directory - Look up University staff, contact them directly from the app, and add them to your personal contacts list. This module is updated every 24 hours with a feed from the online Staff Directory. Events - Want to know what's happening around campus? View the University Events Calendar, and add events to your personal calendar. Emergency - Fast access to campus security, police and emergency numbers. MyIT - A one stop shop for all you University IT service and support needs. Students – Fast access to the Student Central home page, the place for all Western Sydney University student information and support. Library - View Library resources including search tools, library hours, and librarian chat. Shuttle - See where the University Shuttle Buses are in real-time, and how many minutes they are away from your stop. Giving - A fast and convenient method for staff to sign up to the staff giving program. Wellbeing - Get extra help from online services dedicated to your welfare. Careers - Connect with the Western Sydney University Careers service for students and employers. Gradlife - This module will launch the Alumni app - stay in touch with the University after you graduate! Videos - Watch videos from the University YouTube channel, or our Online Learning channel. News - Find out the latest news on campus by browsing our staff and student articles. Residences - Find out about the on-campus accommodation options at Western Sydney University. Books - Order the books you need for your course from The University Store. Food - Specials and info about all the food outlets at the University. Social – Your link to university Campus life activities, run by Western Sydney University Connect. Summer - Get special information about campus facilities over the summer sessions. Clubs – See all the club activities and access the University's Orgsync presence. Sport – See what's happening in the Western Sydney University sporting clubs.